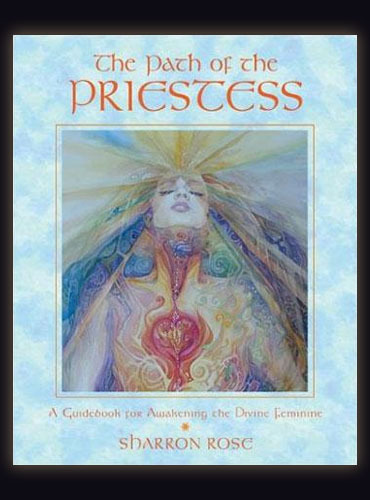 The Path of the Priestess takes readers on a compelling journey deep into the heart of the feminine experience, presenting a rare glimpse of the essential and significant role of women as caretakers of the psychic, energetic, and emotional landscape of society. Author Sharron Rose draws on her years of experience with the ancient arts of tantra, Dzogchen, and Indian and Egyptian temple dance and healing, as well as her understanding of the mystic teachings of the alchemists, Hebrew Kabbalists, and Christian Gnostics. Through thought-provoking analysis of contemporary society’s conditioning of women, descriptions of sacred ritual practices, and teachings on the Goddess traditions, The Path of the Priestess provides contemporary women with the means to walk this time-honored path. Included are specific exercises and visualizations designed to align women with the most powerful and profound feminine role model--the Great Goddess. SHARRON ROSE, an internationally acclaimed teacher, writer, and performer and Fulbright scholar in world mythology, religion, and sacred dance, has been investigating the wisdom of ancient cultures for the past twenty-five years. She lives in Los Olivos, California, with her husband and hermetic scholar, Jay Weidner. There is a sacred tread of light that runs throughout time and space, as we know it, the light of our divine inheritance. It is a continuum. It arises at the birth of creation and forms a sacred path from the divine into the denseness of matter and back again. As we descend from the fullness of this light, into the depths of the material world, this thread of light is always there to sustain us, the light of the Divine, our inner guide and pathway toward-union and illumination. It is the clear light of truth, virtue and integrity. It is that thread of spiritual awareness or essence that flows through all of our lives and incarnations leading us from the pure light of Divinity, along the path of emanation, to the path of return and reunion with the Primordial Source. As women, as mothers, teachers and guides, as daughters of the Great Goddess, it is our sacred duty and privilege to hold this light in our hearts and carry it from generation to generation. This is our essential role as women. To hold the pure light of spirit in our hearts, to keep the lamp of inner freedom burning in the darkness, to nurture and protect this light whatever the cost and to transmit it's radiance, it's exquisite beauty to our men and children. Sharron Rose, M.A. Ed., is a true renaissance woman. A filmmaker, choreographer, composer, author, teacher and performer, she has spent the past thirty years working in the fields of education and the arts to investigate, integrate, and impart the knowledge and wisdom of ancient and traditional cultures throughout the world. Trained from childhood in the classical western arts of ballet, opera and theatre, after receiving a diploma from the Peabody Conservatory of Music, a B.A. in Theatre from the University of Maryland and an M.A. in Education from George Washington University, she became a member of New York City's vital dance/theatre/performance art scene.